Call of Duty fans have been taken on a wild ride through different game developers visions of warfare. 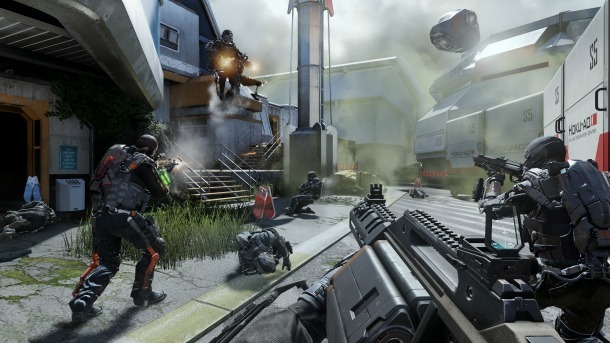 The popular first-person shooter series hit a serious plateau during its Modern Warfare phase, which was followed by a dose of WWII scenarios and Black Ops campaigns. With the 2014 iteration of this annual shooter comes a welcome deviation from the well-worn formula. Sledgehammer Games has managed to throw on a fresh coat of paint and a whole bunch of Exoskeleton suits into the newest COD: Advanced Warfare. Call of Duty: Advanced Warfare takes games onto one of the best single-player campaign rides ever produced. As a member of the Marines, you and your closest friend embark upon a routine mission. However, your loyal ally loses his life in an explosive manner that’s shocking to witness. After grieving over a fellow fallen soldier, the father of your now deceased friend welcomes you to this all-too powerful Private Military Company – Atlas. The bossman at the middle of it all (which is performed by the always awesome Kevin Spacey) gives you access to futuristic gear and powerful allies as you’re sent to take down terrorist threats and protect the freedom of the U.S. The character interactions within the single-player campaign are decent enough, but you won’t find yourself getting emotionally invested in anyone. The acting here is on par with that of your typical military thriller film, which means you’ll hear all manners of passionate screaming and patriotic speeches. Thankfully, the amazing visuals make your jump boosting allies and charismatic boss look…well, amazing. You’ll be in awe during each level due to the insane set piece moments (the explosion of a power plant is visually mind-blowing) and applaud the impressive audio throughout. The current-gen version of this COD sports the visuals needed to back such a multi-billion dollar series. 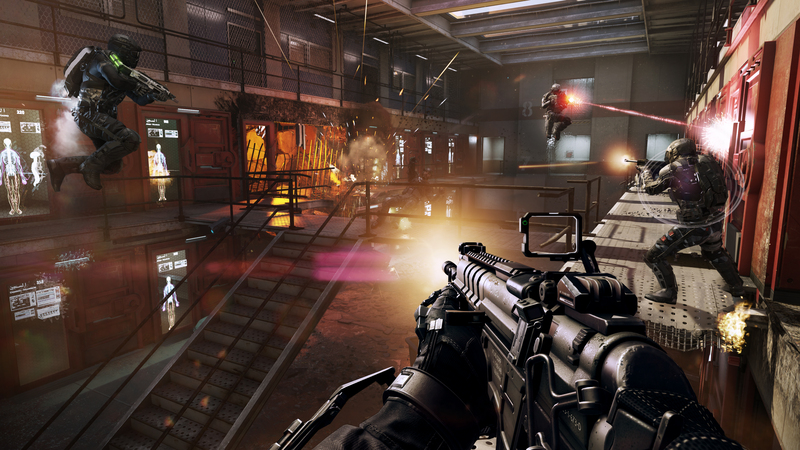 Advanced Warfare’s single-player campaign ranks among the best in the entire series. The presence of Exoskeleton suits and its accompanying abilities given to you during each mission keeps things fresh. Boosting over obstacles, slowing down time to line up shots and even climbing up the sides of walls are just a few of the cool new action you can perform. One minute you’ll be riding on hover bikes while being chased by a helicopter and the next minute you’ll be stealthily picking off terrorists. Getting the chance to use your upgrade points to make your Exo suit and abilities even stronger is welcome. While the story itself is somewhat predictable and unmemorable, the missions themselves are all fun in their own way. Once you’ve gotten through the amazing single-player campaign, you’ll most certainly make your way to Call of Duty’s tried and true multiplayer modes. The familiar modes are still present. The new “Pick 13” system (a slight change up from Black Ops 2’s “Pick 10” system) gives you the option to choose from a huge variety of customization options. It’s nice to see the game give not-so-great players the chance to be on equal footing with veteran players with this system. New players who aren’t capable of nabbing those scorestreaks can opt to attach more weapon customizations of exo suit abilities instead. The “Pick 13” system makes character customization more of a joy this time around. The multiplayer modes still offer players a fast and fluid set of games fans have enjoyed for years. The addition of exoskeleton suits, smart grenades and other types of futuristic gear makes everything feel just a little differently. Matches now seem to fall into soldiers jumping all over the place and staying mobile to stay ahead of the other soldiers. The co-op survival mode is just as fun, thanks to its unpredictable enemy setups and all-around addictive team play. That being said, this is still a Call of Duty game so you’ll know what to expect here. The feel of the game isn’t dramatically different from its predecessors, so fans looking to come back to the series might not get too attached once again. 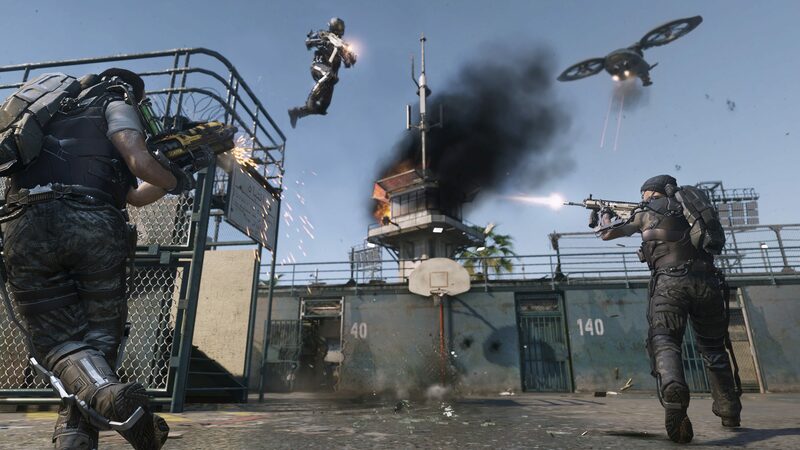 Call of Duty: Advanced Warfare is an excellent addition to a well-worn series. The incredible single player campaign, Exoskeleton abilities and always solid gunplay are all here. The plot itself is your typical Hollywood warfare material and the game itself still hangs onto a formula that’s hitting a state of staleness. All in all though, Advanced Warfare still does enough to change up the formula and give longtime fans a new take on war. It’s the beginning of November and we all know what that means: A new Call of Duty game is about to hit the shelves. Whatever your opinion might be on the games, we can appreciate the advertising blitz that Activision Blizzard puts up every year to market the game. Whether it’s seeing Jimmy Kimmel and Kobe Bryant dodging bullets and rockets, Sam Worthington teaching Jonah Hill the ropes in tactical combat, or watching Robert Downey Jr. take down people in his fighter jet during Guy Richie’s commercial spot, we can always rely on some fun times for the game’s release. This year is no different as Peter Berg steps up to the director’s chair for Call of Duty: Advanced Warfare and brings along his long time buddy Taylor Kitsch from Lone Survivor and Friday Night Lights, the most underrated show on television in the last 10 years. We get Taylor showing you, in a first-person perspective, the ropes of Advanced Warfare. In this new Call of Duty game, you have a jet pack for added mobility. Jump, strafe in mid-air, slide…this pretty much adds a whole new dimension to the game and the former Tim Riggins is going to show you how to do it. Oh yeah, Emily Ratajkowski shows up too. Just in case you really need this trailer to be more geared towards the male demographic. Are you excited for the game or have you had enough? Let us know in the comments below or just comment on our Facebook page as well! Is Netflix’s ‘House of Cards’ a Game-Changer? There was a time when people sat around and listened to shows on the radio. There was a time when silent films became “talkies”. There was a time when cable came around and all of a sudden you had hundreds of channels at your disposal. There was a time when The Sopranos premiered on HBO and changed the way premium cable was regarded. Netflix is hoping that someday the statement “there was a time where people didn’t watch ‘television’ shows on the internet” will find it’s way onto that list. The upcoming Arrested Development may be getting all the news, and Lilyhammer may have been the first, but House of Cards is no shrinking violet by any means. If there is a favorite Christmas movie for me I have to go with Christmas Vacation, but right behind it (We’re talking milimeters here) is my second favorite holiday flick starring Denis Leary and Kevin Spacey: The Ref. The story revolves around the Chasseur family. Let me get this out-of-the-way right now. It’s pronounced ‘Shass-Oor’ and as you must know, it’s an 18th century French Huguenot name. But I digress, the Chasseur family is a pretty well off family with a lovely home… from the outside. Look in and there’s quite a bit more going on. Spouses Lloyd and Caroline are in the middle of some terrible marital strife and their son Jesse is a delinquent who enjoys black mailing his commander at military school for money in his off time. So what do they need to bring their family closer during the holidays on Christmas Eve? Gus, the cat burglar played by none other than Denis Leary. Leary essentially makes the movie with his fast talking, foul-mouthed way with people. This guy is a comedic genius but it doesn’t even sound like he’s trying half the time. He’s just pissed and complains and that’s that. So where does Gus come into play? Well, he and his part Murray are in the process of thieving from one of the richest guys in town when something goes wrong… the guy has an almost road runner like trap set up for thieves which includes spraying cat piss in their face and dropping them down a chute to the basement where waits a very hungry Doberman. With the little community essentially closed off by police in an effort to capture Gus, he does the only thing he can do and that is take Lloyd and Caroline hostage. The movie is funny as hell, but actually reflects some real life drama that people have with their in-laws in the real world we live in. I’ve seen some bitchy mother in-laws who should immediately go to hell, let me tell ya. It also makes one wonder if it would work to force people to sit down and talk things out. Just don’t get any thoughts this Christmas season of sitting your family down at gunpoint to discuss their issues. I give the movie 5 out of 5 Christmas Trees. For more COUNTDOWN TO CHRISTMAS – Click it Here!